Why your phone need to be hacked? There are many reason. First reason, your phone can’t install software without signing it. Then, your phone can’t install cracked software. Almost all cracked software not signed. And you need signing it before it can be installed on your phone. Signing a software is a way to verify that software which will be installed on your phone is from trusted provider. How to signing a software? There are many website for signing a software online. But i won’t explain it here. I will explain, how to self signing a software. Before we start, please install X Plore. You can download it here. Install BinPDA Security Manager on your phone. You can download it here. After installation done, there will an icon SecMan in your Installation folder. Run it. Go to Option->Install root certificate. 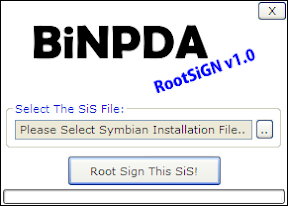 Now your phone can install all software released by BinPDA without signing it first. Install SelfSign released by LeftUp. You can download it here. 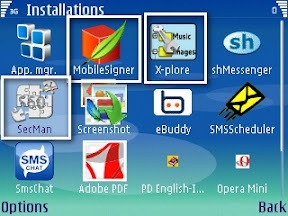 After installation done,there will be an icon Mobile Signer at your installation folder. Check Show Hidden File, Show system files/folder. Replace the 0000001 file with this one (extract it first). And your phone has been hacked succesfully. How to self signing a software? Select installation file that will be being signed. Your installation file has been signed successfully! Then click ‘Root Sign this sis. yang dulunya nggak ada radio bisa jadi ada radionya karena cma softwarenya beda versi,sehingga dibutuhkan semacam software yang mampu memberikan radio virtual.. dan lain jenis moddingnya. ki aku sajakmen meh nuduh koe ngopy paste..
tapi ketoke tekon sek wae..
[OOT] p.agfi melu PE …?!?!?!? I searched for \’Software For I-phone\’ at google and found this your post (\’ur Symbian OS 60 v3 Phone and Self Signing Software! – ..::d3ptzz personal blog::…\’) in search results. Not very relevant result, but still interesting to read. man this doesnt work on nokia E-71 and im no proframer what do i do to hack this thing? @supermatt, what firmware version you have? bos kalo merename file di symbian s60 v2 ke atas dan nokia s40 terbaru pakai Mini Commander ato Mobyexplore gimana biar tidak read only dan bisa merubah nama file? soalnya ceritanya gini di N70 file jar aq rename pake FExplorer misal dari kamus.jar ke kamus.jare biar bisa di send via bluetooth. aq kirim ke hp nokia s40 yg thn 2009 ke atas pakai aplikasi mobiexplorer java, waktu merename tidak bisa, bos mungkin ada solusi? hadooohhhh w coba instal xplor na kaga mau bos…. Damn, awesome website. I actually came across this on Yahoo, and I am happy I did. I will definately be coming back here more often. Wish I could add to the posts here and bring a bit more to the site, but am just absorbing as much info as I can at the moment.